What Is The Best Bakeware Set For Beginners? When it comes to baking, you need to be prepared with all the tools that baking requires. There are actually a lot of tools that you will need if you want to learn how to bake – from measuring cups and spoons down to springform pans and other molds. You will have to be equipped with at least a small set in order to create multiple types of baked goods. The main benefit of having a ba﻿﻿keware﻿﻿ set at your disposal is that you will have practically everything you need to create various baked dishes such as cakes, cupcakes, breads, and even casseroles. Most sets will include the basic tools beginners can use. Whether you are cooking for your family or you want to start a business, these bakeware sets can help you accomplish the dishes and pastries you want to try. It’s a good idea to go for a bakeware set as well instead of buying pans individually so you can be assured of the consistency of the product you are buying. With the multitude of bakeware set options out there, it’s only right that you pay more stringent attention to what you are buying. After all, you are paying money for it. You don’t want to waste that money by choosing low-quality bakeware set that will only last a couple of uses. 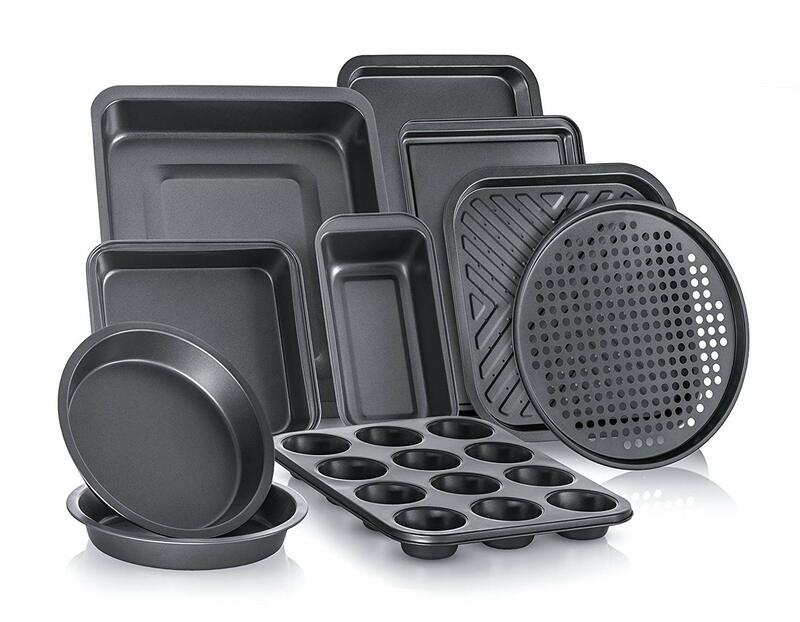 Bakeware sets can come in various shapes and sizes. Before you purchase a set, make sure that the pans and trays will fit your available storage space. Also make sure that each piece can be stored or placed in your countertops or even freezers and refrigerators. As for the ergonomics, try to choose a bakeware set that comes with a nice set of handles that you can comfortably grip with or without oven mittens. Handles are usually overlooked when buying bakeware sets. This is an easy mistake that you could easily avoid if you pay attention to the design of the bakeware set. 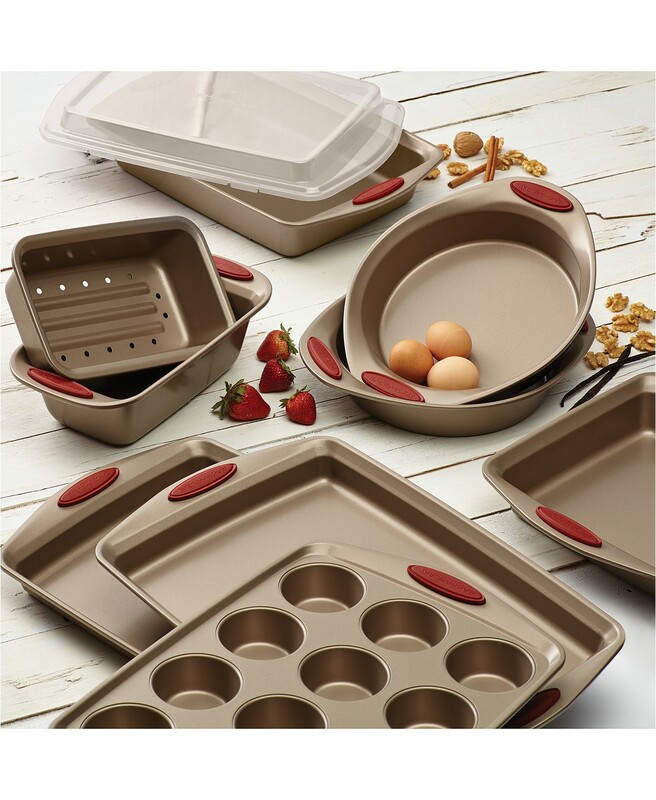 Bakeware sets can be made with an assortment of materials including stainless steel, porcelain, Pyrex, and silicon. If you ask me, each of these materials come with their own pros and cons, but each of them is really effective when it comes to baking. Stainless steel is very durable and easy to clean, great for those who don’t want to spend too much time scrubbing their pans and trays. Porcelain and Pyrex are very attractive, easy to clean, but can be fragile. Some extra care is needed when handling these materials. They can also be a bit heavy. Silicone is very light, flexible and easy to clean but isn’t exactly the prettiest bakeware out there. How big the pans and trays you should get will depend on your baking needs. If you’re a beginner, I suggest getting a set with a medium size. Doing so will allow you to create small to medium sized baked goods, just ideal for practice since you won’t end up with too much waste if anything goes wrong. To determine the overall usability of the bakeware set, determine whether all of the pieces that come with it can be useful for you. 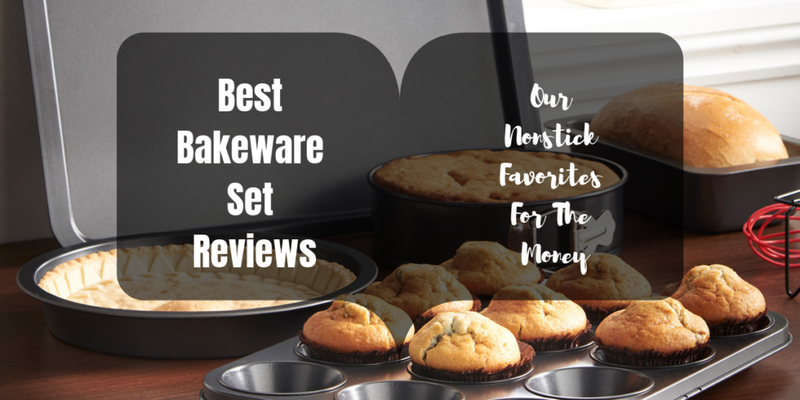 Make sure that the bakeware set you are getting will provide you with all the tools you need. I would also like to suggest not going for bakeware sets with too many pieces if you don’t really need them. Getting a bakeware set with too many pieces will only cost you more money and more space in your kitchen. Stick with basic pieces if you don’t plan on doing a lot of baking yet. If you’re looking for a durable bakeware set that’s also ideal for beginners, then you must check out this Calphalon Nonstick Bakeware Set. What’s great about this bakeware set is that it is made of completely heavy-gauge steel that makes it easy to clean and maintain. It’s material also allows it to become warp-resistant despite being subjected to high heat temperatures. Another interesting feature of this bakeware set is that it comes with a non-stick interior that can release food up to 2x better than classic Calphalon bakeware. ​This set comes complete with 2 8-inch round cake pans, a 13-inch by 9-inch cake pan, a 12-cup muffin pan, a 15-inch by 10-inch cookie sheet, and a medium-sized loaf pan. It’s just right for small to medium baking needs. This bakeware set also comes with a highly attractive design. It has a light color that will allow you to easily pair it with your existing kitchen utensils and will also let you have an easier time preventing common issues like browning. Lastly, this bakeware set is also very easy to clean and maintain since it is completely non-stick and dishwasher-safe. It even comes with a handy 10-year manufacturer warranty that you can rely on if you ever need any fixes or replacements. Another great bakeware set for beginners is under the Rachael Ray brand. For those of you who aren’t familiar with Rachael Ray, she is a TV celebrity chef known for creating all sorts of dishes including baked ones. 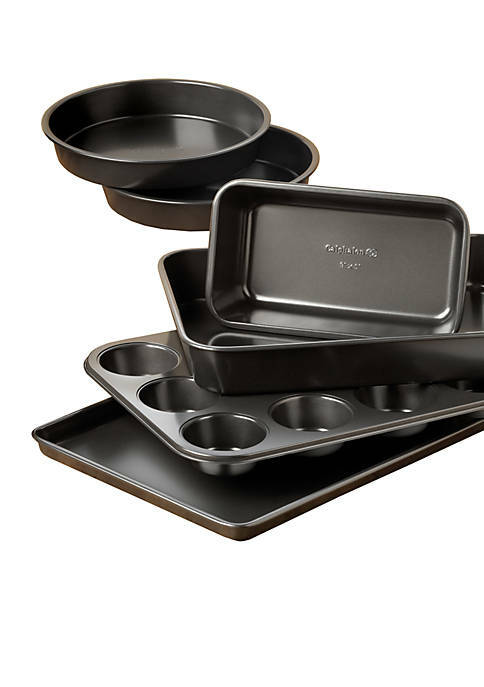 If you decide to get this 5-piece bakeware set from Rachael Ray, you will get a set of pans that you can use for making cookies, brownies, pizzas, or even small bread. 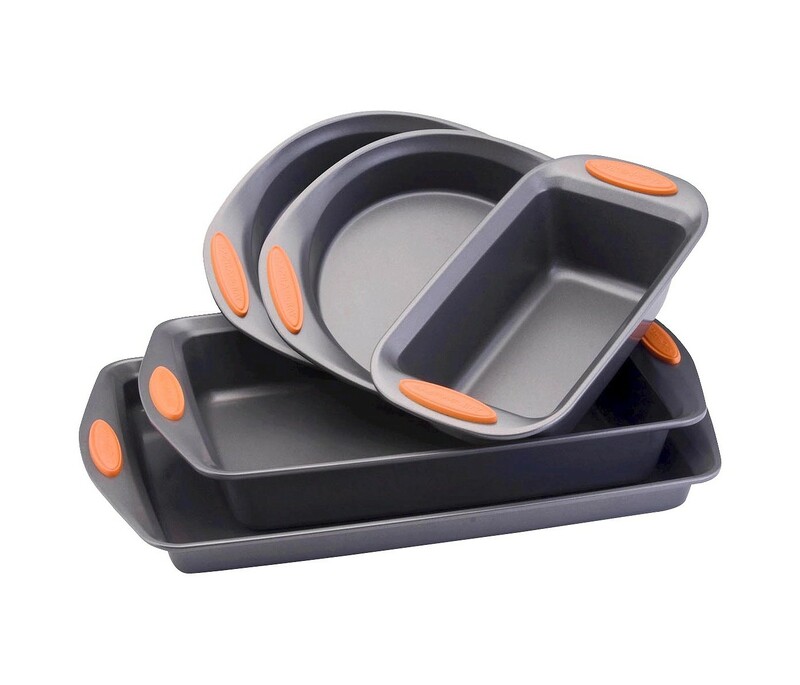 What’s great about this bakeware set is that every piece it contains is completely made of durable carbon steel. It even comes with silicone grips that will allow the pieces in the set to be comfortable to the touch and easy to grip even with oven mitts on. This set is also able to withstand temperatures up to 450 degrees Fahrenheit, the ideal temperature for most baked dishes. Lastly, this set comes with a very attractive design that will make it easy for you to pair it with your existing kitchen appliances and utensils. It’s even completely non-stick for easier cleaning and maintenance. Needless to say, whether you plan to use this bakeware set for yourself or if you plan to give it as a gift, it can surely make any person have an easy time when it comes to baking whether they’re a beginner or not. These are beautiful bakeware pieces. The agave blue is a nice color accent. It truly has a non-stick surface. Customers had no issues baking even the stickiest of recipes. The pans have a nice weight. It offers an even cooking surface. There are no cold spots. This is another cooking set from Rachael Ray’s line of bakeware sets. If you want more pans and trays for baking this is a good option for you because it has more pieces than the former bakeware set. ​This set comes with a very attractive design that will make it easy for you to pair it with your existing kitchen appliances and utensils. It’s even completely non-stick for easier cleaning and maintenance. 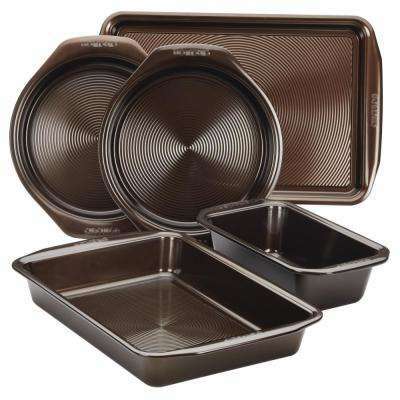 ​What’s great about this bakeware set is that every piece it contains is completely made of durable carbon steel. It even comes with silicone grips that will allow the pieces in the set to be comfortable to the touch and easy to grip even with oven mitts on. I highly recommend this for those on a budget. It has an affordable price tag, great for those who still haven’t decided on what kind of bakeware will truly suit them. It has a nice chocolate brown color that can match your existing cookware at home. This is made from a heavy gauge steel that can protect it from common bakeware issues like scratches and warping. What makes this different from others is the raised circles on its nonstick coating. This prevents baked goods from sticking to the surface of the pan. Not only is this easy to use and easy to clean, it is also backed by a hassle-free lifetime guarantee. This 10-piece set has everything you might need for baking. It’s not just ideal for beginners, it can be useful for experienced bakers as well. For a 10-piece bakeware set, it is quite affordable. The nonstick coating truly delivers when it comes to prevent baked food from sticking to its surface. It heats up evenly, so your pastries will be cooked well. The design is also attractive, making this a great gift idea as well. All of these are winners in my book but let me help you out further in making a decision. Get the Perlli Complete Bakeware Set if you are serious about baking and you want to incorporate it in your daily things to do. It has everything you need and every pan in this set performs well. The Circulon NonStick Set and the Calphalon Nonstick Bakeware Set are perfect for those on a budget and who have a limited kitchen space. You have everything you need in these sets. If you are looking for something you can pass to your children and can last for a long time, Rachael Ray’s Nonstick 5-Piece Set and the 10-Piece Set are great investments. You can only enjoy baking if you invest in the best bakeware set and if you're a beginner, we suggest you get the Calphalon Nonstick Bakeware Set as it is easy to use, maintain, and clean. You’re probably looking for more kitchen essentials to buy. Do check out our homepage for valuable product recommendations and to read more product reviews.